BUSIA, Kenya – Armed with a hoe and Wellington boots, George Wandera planted bamboo seedlings in neatly dug holes along the banks of a stream on his farm that feeds a nearby lake in western Kenya. Large swathes of Kenya — including parts of Busia county where Wandera lives — are experiencing severe water shortages, which have damaged crops and left 2.6 million people in need of aid. The country’s wetlands too have suffered in the drought, putting at risk communities who depend on them for fishing or irrigation, and who rely on them to act as a buffer from floods and drought. “Wetlands such as lakes and floodplains act as natural safeguards against disasters, by absorbing excess rainfall during floods, with the stored water then available in times of drought,” said Julie Mulonga, program manager at Wetlands International Kenya, a conservation charity in Busia. During the current drought, farmers and herders have been drawing water from the wetlands, and streams feeding them have run dry. Unpredictable rainfall is not the only reason Kenya’s wetlands are under threat. Local communities have also been draining them to grow crops, Mulonga said. Wandera remembers when large parts of the Sio-Siteko wetland, near the border with Uganda, were drained to make way for farmland. “We never thought our activities were harmful until we saw the consequences – that is, more floods during the rainy season and less water during the dry season, leading to a decline in vegetation and animal species,” he said. In February, the Kenyan government launched its first wetlands management policy, to help protect the country’s wetlands. “If well-managed, wetlands can make communities more resilient in the face of extreme weather,” said Mulonga. 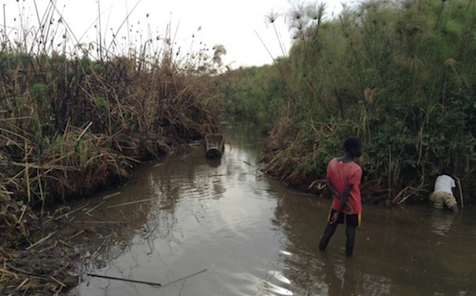 Charities like Wetlands International Kenya, with support from the government, are working with communities in Busia to protect their wetlands, while helping them develop alternatives to farming like beekeeping and eco-tourism. They are also planting indigenous trees and bamboo, and using papyrus – a wetland plant – to make baskets and sandals. “We need to strike a balance between the population’s needs and the need to preserve natural habitats,” said Robert Sanya, head of Eco Green, a Kenyan charity which campaigns on environmental issues. “Bamboo for example can absorb large amounts of carbon from the air – which helps mitigate against climate change – while its extensive network of roots prevents soil erosion, thus making it ideal to conserve the banks of rivers and streams, which feed into wetlands,” Sanya said. Wandera said some farmers are building greenhouses to cultivate vegetables like yams. “The greenhouses are expensive to build – at least $400,” he said. “But they ensure the farmers can grow vegetables using less water and land, thus preventing their encroachment on wetlands,” he added. This article was first published by Thomson Reuters Foundation, which produces journalism on climate change, humanitarian issues, resilience, women’s rights, trafficking and property rights. Thomson Reuters Foundation is the charitable arm of Thomson Reuters, which includes the Reuters news agency.